GALVmed partner Hester Biosciences Limited has launched a campaign to sensitise farmers about animal health and management. The campaign is one of the initiatives to kick start a new programme which aims to provide over two million smallholder farmers with animal health products in the Indian states of Uttar Pradesh and Bihar and in Nepal over a period of five years. 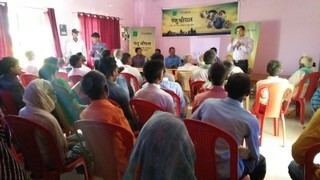 The campaign, dubbed Pashu Chaupal (a Hindi word meaning meeting place in the village to discuss matters livestock) was launched in collaboration with India based media company Gaon Connection Private Limited (GCPL) targeting rural communities on varied subjects, including animal health and management. During the campaign period, the Hester and Gaon Connection teams are conducting at least ten village meetings per month in different districts of eastern Uttar Pradesh. Experts from livestock and agriculture sectors join these events enthusiastically, to give a holistic solution to issues affecting smallholder livestock farmers as they usually do crop farming. To date twelve Pashu Chaupal events have been convened reaching over 1000 farmers in districts of eastern Uttar Pradesh (Azamgarh, Varanasi, Gorakhpur, Kaushambi, Chandauli, Barabanki, Sitapur, Allahabad and Faizabad). During such meetings the experts highlight the importance of regular deworming and vaccinations of livestock and poultry against diseases such as PPR and Goat pox in goats, PPR in sheep and Newcastle disease in poultry along with good nutrition and management practices. Audio visual awareness tools such as short videos are used to aid in learning. Dedicated sessions on addressing questions from farmers are also held where experts give advice in a variety of subjects covering livestock and crop. This campaign marks a first of such a mass awareness campaign for smallholder farmers by a private company in Eastern Uttar Pradesh. GALVmed is supporting Hester Biosciences Limited to develop a market to make available animal health products to smallholder livestock farmers in Uttar Pradesh, Bihar and Nepal.